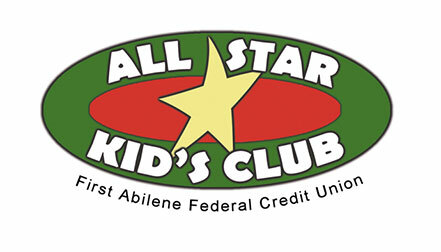 First Abilene FCU is excited to announce the All Star Kid’s Club. Children ages 12 and under are invited to join the coolest club in Abilene! All it takes is $6, and your child will be on their way to save. With Ace the All Star on their team, your child can learn great ways to earn and save money. Here’s how it works! For every $10 deposit made, your child will receive a small prize. Though they can withdraw money at any time, First Abilene FCU wants to teach your children about the excitement of saving! When your All Star saves $500, they can roll over their balance into an interest-earning, one-year Certificate of Deposit (CD). After one year, they can withdraw their money or roll it over into another CD. Members of the All Star Kid’s Club will receive an introductory package including a piggy bank, credit union coloring book, cool prizes and a membership card. Parents will receive great information about teaching your child to save and other useful tips.